One of the oldest and most tired of adventure game puzzles is the locked-door-with-key-on-other-side puzzle. The canonical solution involves sliding a thin mat under the door, then poking the key from your side so it falls onto the mat, then withdrawing the mat to access the key. I riffed on this in Savoir-Faire, with an alternative, magical solution to the puzzle. 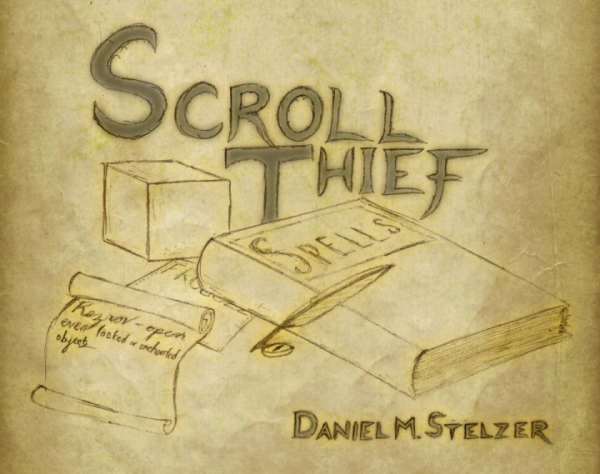 In Scroll Thief, the key stuck in the door is enough to make the door immune to REZROV, your magical way of unlocking locked things, and you can waste quite a bit of time trying to figure out what else might work. In the end, there’s a way to simply go around and take the key out of the door by hand from the other side with no shenanigans, undercutting all your expectations. It is, essentially, a joke told not in words or pictures but in design. I love design jokes. This entry was posted in interactive fiction, parser, puzzles, Reviews by Emily Short. Bookmark the permalink. I don’t think the PC is really treating the adventurer as an equal in the second part of the game. It feels that way, yes, but only because you used magic to make them your friend — ultimately you’re still brainwashing them, you’re just being more subtle about it by using vaxum instead of serage. In particular, if you hit them with the reversed version of vaxum after charming them, they go berserk and kill you, and it’s not at all clear whether that’s the reversed spell making them hostile, or the reversed spell is just un-enchanting them and they’re killing you because you keep brainwashing them in different ways. Part of what makes it unnerving to me is that the friendly way the adventurer behaved while enchanted by vaxum made me want to view them as a genuine friend… but then I’d remember that they only view me as a trustworthy friend because I magically brainwashed them. It shows how seductive that sort of power is, because it’s so tempting for the player to just view the vaxum-ed Adventurer as a friend and ignore the uncomfortable fact that they used magic to force the issue. I considered exactly this, actually, but there are two things about the game that made me view it in a more favorable light. I’m not sure they’re definitive, but I found them suggestive. 2) VAXUM doesn’t work on the snake unless you’ve cast NITFOL first, in which case the snake looks thoughtful and nods. This suggested to me that VAXUM is less a mind-control spell and more something like offering a treaty, which had to be both comprehended and accepted by the other creature. On the other hand — as I mentioned on the intfiction forum though not here — I did feel a little weird about being able to summon the sleeping librarian and then leave her lying around in her nightgown. Even though she’s protected with spells, this feels like such a vulnerable situation that I felt anxious for her and wanted to be able to cover her up and/or send her safely back home (and I gather that the author has tweaked the game to make that possible again). Summoning the librarian is also optional, if you use the alternative solution to the one puzzle she helps you with (Or, I suppose, if you’re cheaty and use the information learned from a past playthrough, though come to think of it I never tested it to see if the game comments on that.) The way the PC treats the adventurer stands out to me a bit more because it’s non-optional if you want to complete the game. But I guess the mental process I went through here was “eh, this spell is mean, but I guess we’re just in that kind of world, and I seem to be stealing and vandalizing this place too, so whatever” — dismissing the NPCs as having no interiority to speak of — and then began to walk back from that as we got to see more and more of what they were feeling and thinking. Thank you again for the detailed review and discussion! It feels weird commenting directly on a review of my own work, so I’ll just drop in to mention one thing: the two bugs mentioned above (with two pairs of similar commands not giving equivalent responses) have both been fixed in today’s build. I’m still searching for a more elegant solution to the LOOK IN one (which right now uses an ugly after reading a command rule), but from the player’s perspective it should work, which is the most important part. Footnote: when I played, the Adventurer was female. Not sure if it’s random, or because I chose male for my PC’s gender. It’s based on the PC’s gender here. When people reported that the pronouns were getting unclear in one scene, I took the easy way out and made the Adventurer always use a different pronoun from the player (“he” if the PC is female, “she” otherwise). Not the best solution, but it also gave me a chance to experiment with some new Inform features.